This breed originated in the Hiyalayan mountains of Tiber over 200 years. They were bred by Buddist monks and there is a lovely ledgend that they were trained to turn the prayer wheels in the monasteries. Nobody knows if this is true, but they were known to be companions to the monks and highly valued as watchdogs, warning of people approaching and their favourite place to keep guard, was high on the monestory wall. . . It is said that they were never sold, rather they were gives as treasured gifts to esteemed friends. 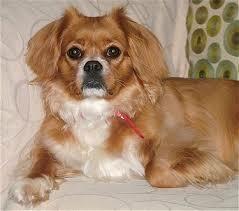 Although the breed arrived in the UK around 1899, very little breeding occurred until after World War ii. The breed arrived in the Uk as late as 1966 and the AKC recognized the breed in 1984 as non-sporting. They are not actually Spaniels, however at the time they became known in Europe they were referred to as Spaniels, simply because people at that time, tended to call any small long-haired lap dog a Spaniel. They were given the nickname Tibbie. This little dog can make a wonderful addition to the family, but what is very important is early socialization at puppy school and continued socialization, or he may be wary and snappy towards strangers, due to what he was bred for. He does make a wonderful watchdog, and will try to find the highest place to sit and look out the window or at the gate - a veritable little monkey when it comes to climbing skills. They are known to bark, so a good idea is to teach Bark & Shush while still a pup and keep the exercise in place which will help to prevent excessive barking. This is a busy little dog and will not take well to be left alone for long periods, or left outside. In a case such as this excessive barking and destructive behaviour could well develop. He does need a daily walk and is not hard to train, however, he is very independent, so use positive reinforcement methods and rather have several short training sessions during the day. If you get into a situation of conflict, you may come off second best! Another thing to be careful about, is that this little one can become very dependent on his family, so teach Alone Time Training, right from being a pup, and keep the practice in place - if you dont Separation Anxiety may develop. On average the Tibbie does well with thee same breed, but important you must make sure that your dog has been well socialized so that it will accept another dog into the home. ​On average they do get on well with other dogs, however never leave this up to chance. Do all you can to go to Puppy Socializing and continue the socializing. This is what makes a major difference and will put in place a solid social foundation. They tend to be good with other animals, however it is always a good idea to introduce them as pups. They tend to be very affectionate and also protective of children. 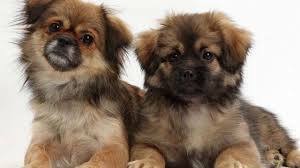 However this is a small breed dog and small children are not always the best companion as this dog can be hurt easily. All dogs should be socialized to children when they are pups - children of different ages and sizes. It is also important that parents teach their children the correct way of approaching dogs and interacting with them, and to treat the dog with respect. . This breed tends to be healthy but there are some genetic problems they may be prone to such as patellar luxation, deafness and epilepsy. There are a few eye conditions which may present such as PRA (progressive retianl atrophy), entropion and retinal dysplasia. Do take your pup for socialization - pups should start at 8 weeks of age and this should not be missed - lays the foundation for future social interaction especially as this breed can be wary and is a protective breed.